Kip Moore celebrated his fourth No. 1 single, “More Girls Like You,” on Tuesday (Feb. 13), with a celebration at Analog at The Hutton Hotel in Nashville. 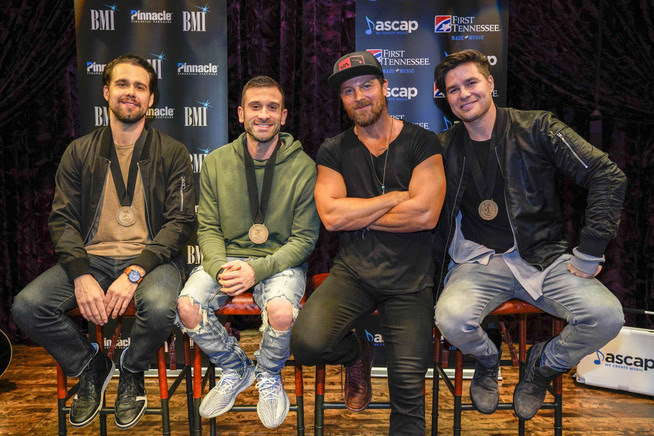 The party, hosted by ASCAP’s Evyn Mustoe and Michael Martin, as well as BMI’s Bradley Collins, feted Moore and the song’s writers Steven Lee Olsen, Josh Miller, and David Garcia. The song marks the second No. 1 for ASCAP writer Steven Lee Olsen, following his smash hit “Blue Ain’t Your Color,” recorded by Keith Urban. “More Girls Like You” is the first No. 1 for BMI writer Josh Miller, and the first country radio No. 1 for ASCAP writer David Garcia (known for his hits in the Contemporary Christian market). Others celebrating the chart-topping song included UMG Nashville Chairman & CEO Mike Dungan, MusicRow‘s Sherod Robertson, Cornman Music’s Nate Lowry, and CMA’s Brandi Simms. First Tennessee Bank and Pinnacle Bank were the partners for this No. 1 party. Moore is on the road with Luke Bryan this week, and in March, he will return to Europe’s Country To Country Festival.